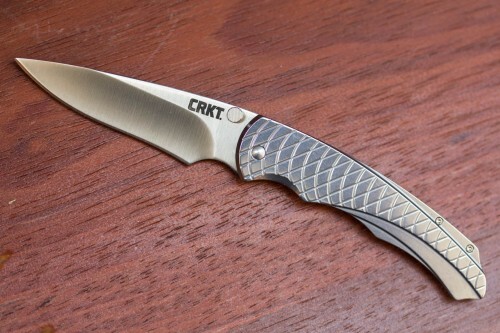 Brand new from CRKT, the grooved pattern stainless steel handle makes the Cobia one beautiful knife. With the Outburst assist opening mechanism and tapered thumb stud, opening this knife is a breeze. 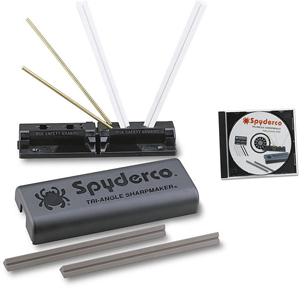 Also includes a stainless steel, tip down carry pocket clip and simple dependable frame lock, both sleek and sturdy. This knife is a must see, so check it out at www.knifecenter.com. We are having a premonition… That you will love this knife! The Premonition is the latest pocket knife from Columbia River’s boy wonder, Gerry McGinnis, who is producing a plethora of pocketknives while completing an engineering degree at North Carolina State University. The Premonition follows Mr. McGinnis’ trend of flipper opening knives, which allows for assisted-fast opening without the weight or potential legal issues of the assisted mechanism. When opened, the flipper also acts as finger guard. The opening speed is perfectly complemented by a thin, sleek design, light weight, and great balance. The black and blue G-10 handles round everything off. How can we offer all of this starting at $28.95? You’ll just have to check your crystal ball. The Biotac knife harness, designed by Ed Van Hoy and produced by Columbia River, will change the way you carry your fixed blade knives. Particularly great for neck knives, the Biotac allows you to position your knife comfortably in six basic inverted positions, and it is fully adjustable so that you can position it the way you like. The Biotac requires a positive locking sheath, with a snap or detent to hold the knife securely, because of the inverted carry. It works great for both open and concealed carry. New Columbia River Carson M4-02S Assisted With Stag Handles! 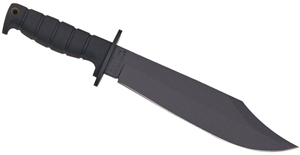 The Kit Carson M-16 series is known as a hard use tactical line – and it has consistently been one of the highest regarded series by knife users year after year. You need a little style with your tactical folder, and the M4 series is it. A little smaller, a little more sculpted, and a lot faster opening – thanks to the OutBurst assisted opening mechanism. 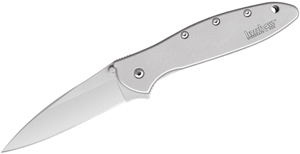 The M4-02 in particular features a beautiful stag handle and a 3.25″ blade with the LAWKS knife safety mechanism. Frank Centofante started making pocket knives in 1970. A year later he became a member of the Knifemaker’s Guild, and has since served on the board of directors for 20 years, including 8 years as the President of the Knifemaker’s Guild. His prowess at knifemaking has resulted in his being called the Godfather of the Knifemakers Guild. Unfortunately, Frank Centofante passed away in September of 2009. Before he passed, however, he designed one last collaborative effort with Columbia River. In honor of his memory, Columbia River chose to call his final collaborative knife the Centofante Tribute. The Centofante Tribute comes in two different models. The Tribute has a 3.125″ blade, while the Tribute 2 has a 2.875″ blade. The design is simplicity and elegance. The slender spear point blade is opened with a classic nail nick, and is complemented by a red wood patterned Micarta handle. The lockback locking mechanism allows the handle of the knife the be extremely thin, just a little bit over a quarter of an inch at its thickest. The result is a thin, light blade that would go well with a suit, but is also capable of anything you might need your every day carry knife for. All of this for under $30.00.